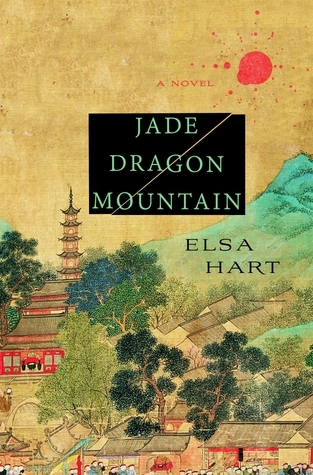 A special mélange of reading Agatha Christie and learning the ancient history of the Tibet-China Tea Horse Road inspired Elsa Hart to start work on her ambitious debut novel, Jade Dragon Mountain. Set in southwest China in 1708, the twisting historical murder mystery has a compelling sleuth, Li Du, at its heart. Exiled from Beijing for consorting with the emperor's enemies, nomadic librarian and scholar Li Du makes his way to Dayan, a city near the Tibetan border, nestled under the looming presence of white-tipped Jade Dragon Snow Mountain, where his cousin is magistrate. 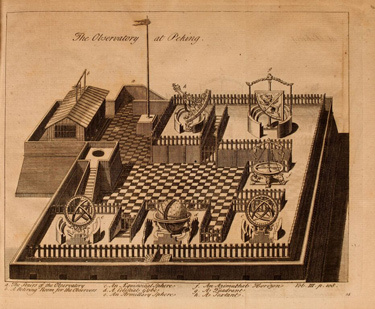 As the city prepares for a visit from the emperor, in honor of the coming eclipse that the divine leader has "commanded," a Jesuit astronomer is found dead. Li Du suspects foul play. To help his cousin, he begins to investigate, but his own life is soon endangered. Born in Italy, Hart has also lived in Russia, the Czech Republic, and the United States, and for three years she and her husband called the city of Dayan (now Lijiang) home base. She shares some of the root inspiration for Jade Dragon Mountain, which will be the first in a series about her librarian detective, Li Du. 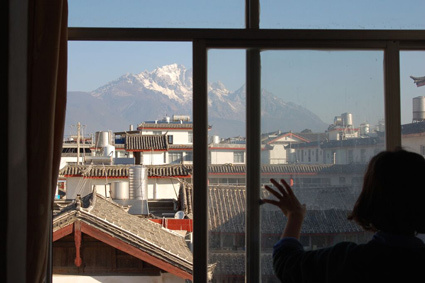 "The view of Jade Dragon Snow Mountain from a tiny one-room apartment on the outskirts of Lijiang's old town offered daily inspiration." Goodreads: Tell us about the time you spent in Lijiang and how that kicked off your writing. 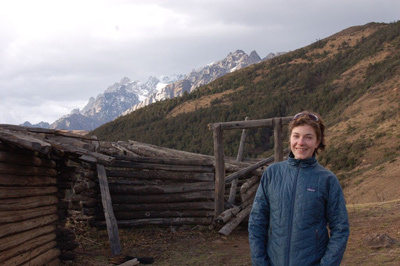 Elsa Hart: I first went to Lijiang in the summer of 2010, after my second year of law school. This is usually when law school students look for a summer internship that could lead to a job after graduation. I decided to go to China instead because I knew that my husband would be conducting botanical fieldwork there for several years, and I already had it in my mind to join him after I graduated. I spent the first month studying Mandarin through a program at a university in Kunming, then took an overnight train to Lijiang. It was during that summer I had the idea for what would become Jade Dragon Mountain. We were renting a room in Lijiang. Many buildings in the city were destroyed by an earthquake in 1996. After the earthquake, the decision was made to reconstruct Lijiang in its traditional style. Now the Old Town in Lijiang is a major destination for Chinese tourists in China. Early in the mornings I could easily imagine that I was walking through the same cobbled alleys that connected the market to the inn hundreds of years ago. A replica of the Mu mansion exists as a museum. Nothing is left of the original buildings, but several of the cypress trees above it are old enough to have seen the first Mu mansion. Later in the day the modern world becomes harder to ignore, as thousands of tourists pose for pictures and the Old Town bars play thumping techno late into the night. "An abandoned hut (elevation approximately 3,800 meters) was a reassuring landmark during long days of data collection around the south summit of the mountain." We spent about half our time in a field station on the shoulder of Yu Long Xue Shan—Jade Dragon Snow Mountain. I was reeling from overstimulation in Lijiang and welcomed our trips to the mountain. We could carry up enough food to last five or six days, so we'd fill our backpacks at the market and take a bus to the trailhead. Stone stairs built into the side of the mountain lead, in an hour or so, to the field station above. The altitude at the field station is 3,100 meters (approximately twice as high as Denver, Colorado), and each day we hiked to about 4,000 meters to collect data. It takes a while to adjust to altitude, and I had trouble sleeping. So at night I'd listen to BBC radio dramas adapted from Agatha Christie novels, which I have always found extremely comforting. At the same time, I was learning about the history of the area. There was a little museum in the Old Town devoted to the Tea Horse Road, the network of trade routes that brought tea from China's southern tea forests to Tibet's high plateau. One day I was very high on the mountain, and feeling the effects of altitude, which often involve a lessening of logic. I started to think about whether it would be possible to set a mystery on the Tea Horse Road following the same narrative pattern as Murder on the Orient Express. I thought about whether a caravan's isolation in these vast mountain landscapes would be enough to mimic the trapped-in-a-train effect without the actual walls of train cars. That is not the story I ended up writing, but that is where the idea started. 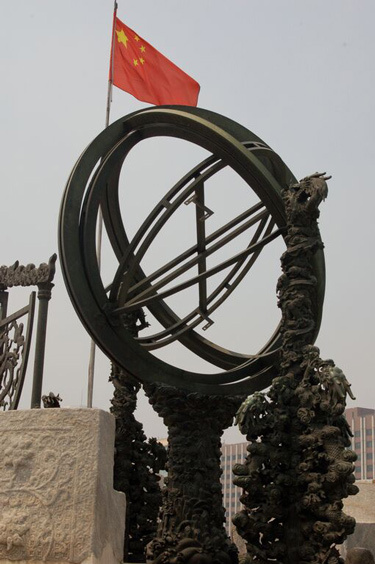 "The old Beijing observatory still stands, surrounded by construction and elevated highways, but most of the original astronomical instruments have been replaced by replicas." GR: What was your inspiration for the character of Li Du? EH: It took me some time and many different sources to find him. He is inspired in part by the 17th-century Chinese traveler named Xu Xiake, whose travel journal Li Du carries with him. The concept of Li Du as an exile developed gradually. I was reading classical Chinese poetry (in English, though I studied the Chinese characters a little bit), beginning with the beautiful translations of Tang dynasty poems by Qiu Xiaolong, who also writes mysteries. I was moved by the language of exile and found myself taken back to the Anglo Saxon elegies that I'd studied as an undergraduate. I saw in Li Du the same deep emotion and also a stubborn unwillingness to relinquish an exile that had taken on a self-imposed dimension. I remember reading—I think it was in Julian Ward's study of Xu Xiake's journals—an excerpt in which Xu Xiake describes the importance, when a traveler sees a beautiful tree on a mountain, of approaching it first from one angle, then walking away from it and approaching it from a different angle, and so on, until you really know the tree. And that struck me as something a detective would say about approaching a mystery. I didn't actually ever think to myself, "I will make Li Du a librarian." I was writing a piece of dialogue in an early draft, in which Li Du introduces himself to another character. I wrote in his voice, I am, and finished the sentence with, a librarian. I never questioned it. Librarians in novels have the power of archetypes for me. I think that if I didn't know the cards in a tarot deck, I would assume that one was the Librarian. My mind goes to the stories of Jorge Luis Borges, to Lucien the librarian in Neil Gaiman's Sandman graphic novels, to Will's father in Ray Bradbury's Something Wicked This Way Comes, and of course to Umberto Eco's The Name of the Rose. I could personally identify with a main character who feels a physical thrill at stepping into a library—a sense that it is a sacred space. Finally, it is an essential part of my inspiration for Li Du that he is a traveler in a place that, while technically part of the Chinese empire, would be in effect a foreign country to a scholar from Beijing. Li Du is encountering a landscape unknown to him. GR: How did you pick 1708 as the year for your story? Did you uncover any surprising or favorite facts about the time period during your research? EH: I became interested in the Jesuits who traveled to China beginning in the 16th century. Reading records of their travels, I got the impression that, for many of them, missionary work took second place to educating themselves about Chinese language and culture. One of the most important research moments for me was my introduction to the personality of the Kangxi Emperor. This came from an incredible book written by Jonathan Spence called Emperor of China: Self-Portrait of K'ang-Hsi, in which the author translates and assembles various documents written by the Kangxi during his reign. The result is a stunningly real portrait of a complicated person: an intellectual, a man coping with deep insecurities, who can be a complete dork (at one point he insists on filling lanterns with fireflies just to disprove the cliché that it is possible to read by their light), and simultaneously a ruler of terrifying power whose campaigns to subjugate the border regions of China were bloody and brutal. The story of the calendar wars absolutely took over my mind for a while. 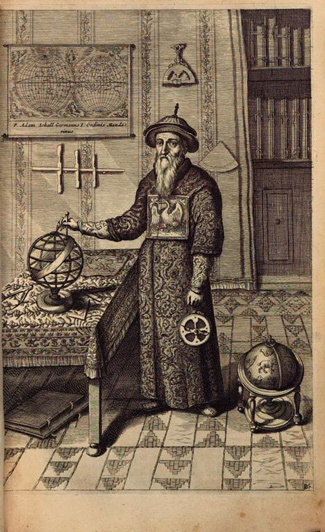 I just couldn't get over the image of a Jesuit, a Manchu shaman, and a Muslim astronomer having a competition in the Forbidden City to see who could predict an eclipse most accurately. And the Jesuit was doing it to save his life. I was floored. I couldn't believe it was a real story. This was a lesson for me as I developed my writing style. You think you've gone too far, stretched everything too much, and then you find a historical anecdote so weird, it makes your imagination seem staid. 1708 became the exact year based on the wavering status of the Jesuits in the Chinese imperial court at that time, and on the memories I wanted Li Du to have available to him. 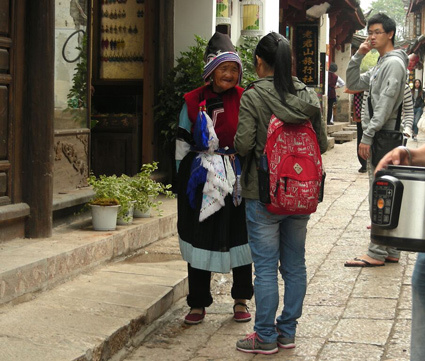 "A Lijiang tourist asks a local for a picture." GR: Do you have certain books or authors that are favorites in the historical mystery genre? EH: The Name of the Rose was huge for me. I first read it in middle school. I found a copy of it one day in a little English-language bookstore in Kunming, and it became almost a talisman while I was in China. Another favorite, and early introduction to the genre, was The Devil in Music by Kate Ross and her other three Julian Kestrel mysteries. The Brother Cadfael mysteries by Ellis Peters settled very deep into my imagination at a young age also. EH: I am coming close to finishing an account of Li Du's second adventure. In addition to posing a new problem for Li Du to solve, the second novel looks deeper into Li Du's past and the reasons for his exile. There is a lot more of Li Du's story to tell. I'm taken with the courage Elsa Hart has taken in her own life. It would be hard for me to think of moving from New York to Maryland - no less China! Reading about her lifts my spirit even higher. I look forward to reading her works. These are all subjects I find fascinating - can't wait to read this! "Librarians in novels have the power of archetypes for me. I think that if I didn't know the cards in a tarot deck, I would assume that one was the Librarian." Love this interview. Compassionate, intuitive and articulate. That is the Elsa I know and love. And I cannot wait to read this book! Come on Amazon! Speed it up! Has Elsa Hart read or heard of the Judge Dee murder mysteries by Robert Van Gulik? similar except Judge Dee is the magistrate.